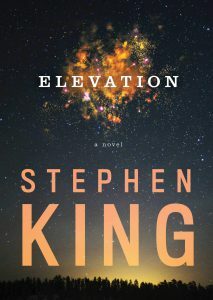 When a Stephen King book releases you better believe I’m one of the first ones to read it! However, I wasn’t so sure about Elevation. To begin with it’s just a tiny little book??? I mean we all know King’s books are these huge mammoth tombs that you risk being crushed under while trying to read. And this one isn’t horror?!?! But, with all that being said I devoured this book and it was AMAZING! So sweet and touching in all the right ways. Anyone who thinks King isn’t capable of writing anything but horror really needs to give this one a go. So, on to the food! In Elevation there is a lesbian couple who is trying to make a go of running a Vegetarian Mexican restaurant however, most of the locals refuse to eat there. I say it’s their loss because that sounds super delicious to me! My version of Vegetarian Mexican would start with one of my all time favorite recipes Crunchy Black Bean Tacos. I’d serve them with Avocado Cream, and Fresh Juice Margaritas. Then finish the meal with Cinco Leches Cake. Let me know if you try one or all of these recipes. Bon Appetit!